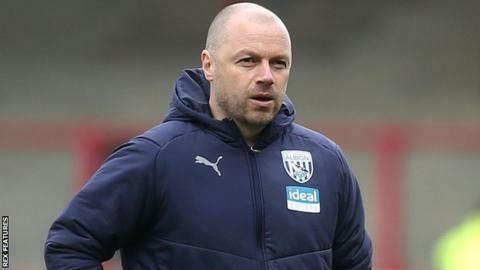 Shan, 40, took over in a caretaker capacity after Darren Moore was sacked as head coach on 9 March. After starting with three wins, Albion then lost twice prior to Saturday's 4-1 home victory over Alex Neil's Preston. "He has fully earned this opportunity to take us to the end of the season," said technical director Luke Dowling. "He has earned the support and confidence of the players who have bought into the structural and organisational changes Jimmy has introduced." It was thought Shan might be taking care of his last game on Saturday after Preston boss Neil was strongly linked with the job. But, in the wake of Neil signing a new contract at Deepdale, Albion have now given Shan their full support, while also promising to enlist someone with "experience" to help him. "He has the backing of everyone to push on now and take us forward with momentum," Dowling added. "But Jimmy has impressed everyone with the way he has tackled the challenge. "He is confident in his abilities, just as we have confidence in him, and he has convinced us all that our best prospects for promotion lie with him overseeing the first team." "From a personal point of view there is huge, huge pride to be given the responsibility. It is a chance to see the journey through that began at the end of last season. "I've heard it said that with two or three extra games we may have stayed up last season. "My aim is to make sure we get those extra games at the end of this season and complete our road back to the Premier League."